A new space on Granville Street could have been named any number of art-history puns, or a given the name of a famous artist. Instead, its name is simple and straightforward. 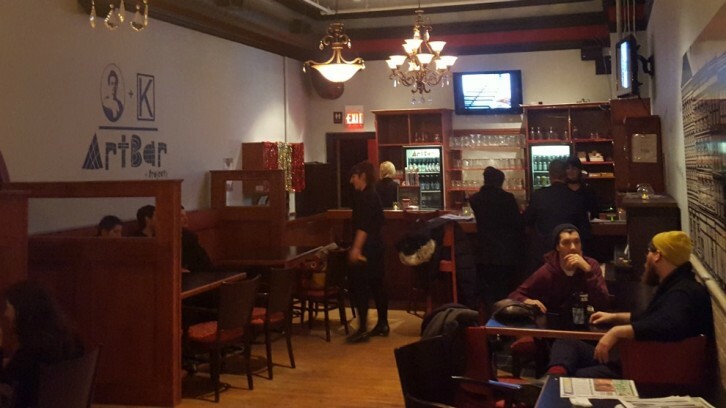 Art Bar is a new space in Halifax’s artist hub. Open for weekly evening events and exhibits, the space opened in January, to coincide with the Art Gallery of Nova Scotia’s exhibit The Last Art College, a retrospective on NSCAD’s so called golden years of the late ‘60s through ‘70s. The bar is a collaboration between the Anna Leonowens Gallery and Halifax’s locally renowned art society, the Khyber. It’s nestled among the other properties on Granville Street, taking up residence where the restaurant Brussels used to be. Not much has changed in the space. The old wooden paneling and chandeliers are still in place, giving it a classic and subdued, old-world feel. Melanie Colosimo is the director of the Anna Leonowens gallery and one of the main people involved with getting Art Bar up and running. When NSCAD announced it would be vacating the Granville campus, now known as the Fountain Campus, ideas started to be put in motion. The bar is run by staff at the Khyber while the programming is shared between the Khyber and the Anna Leonowens Gallery. The bar doesn’t need to pay rent because the space is owned by NSCAD, so the overhead for the space is relatively small. The bartenders are paid staff from the Khyber and all of the money made from the bar goes back into paying artists and organizing new events. For Colosimo the Art Bar was the product of the right place and the right time. “NSCAD had a few vacant spaces. They just confirmed that the Khyber would be moving into the old Christmas by the Sea storefront that had been vacant for almost a year. They were also in talks with the Atlantic Film Festival to move into a few other vacant spaces, so that left the Brussels restaurant,” says Colosimo. The Anna Leonowens Gallery runs student exhibition programming throughout the year. Exhibitions are put up Sunday, opened to the public on Mondays and close on Saturdays. This doesn’t leave the gallery with a lot of time to do any other events or live performances, this is where Art Bar comes in. 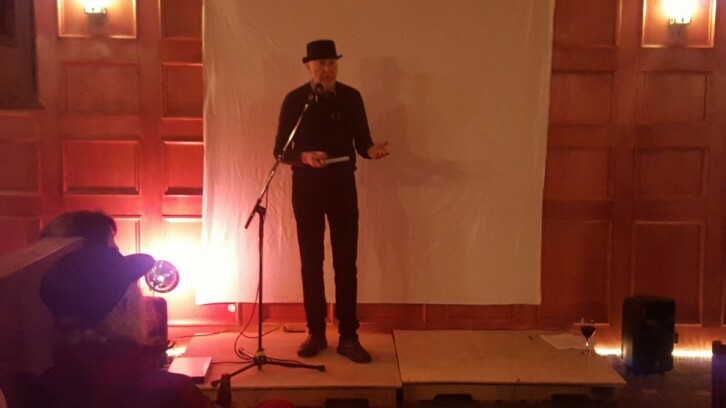 Art Bar has a scheduled program for each week including weekly events, artist talks, workshops and music nights put on by either the Anna Leonowens or the Khyber. The official title for the Art Bar is Art Bar + Projects. These projects span from NSCAD’s Research Hangouts, where professors have a chance to talk about their research in a public forum, to Cabaret-Voltaire—Atlantique, a celebration of the 100th anniversary of the Dada art movement. NSCAD professor Bruce Barber was involved with the planning for the space. He holds the cabaret every Monday after the Anna Leonowens Gallery’s openings. He says that the space is well-suited for a cultural bar. NSCAD is spread over three campuses and Colosimo says having a place for the artists to meet and share ideas has brought together the community. “Students are very excited about it. They’re happy to have a space. They’re asking me all the time ‘Is this forever. Can this be forever?’ Same thing with faculty,” says Colosimo. Sarah Millet, a fourth-year NSCAD art history student agrees. Though NSCAD is moving out of its long-term home on Granville Street, Colosimo is excited about the potential the changes have for the community. I think NSCAD’s been turning a corner. Some people see us moving out of here as a bad thing. But it’s hilarious how much opportunity that news has presented to us at the same time,” she says. Art Bar was always planned as a temporary use of the empty commercial space on Granville Street, but Colosimo hopes they can expand on their original ideas. “The programming that we have in place is only until April, but the plan is to keep it going until we are out of here, until we’ve been given the boot,” she says.